Strawberries are small, herbaceous plants belonging to the Rose family. They are perennial, propagating by means of runners. The white flowers have the general characteristics of the apple blossom and the rose; that is, five (double) sepals and five petals, with numerous stamens and pistils. The word strawberry is both perplexing and scientifically incorrect. The edible part is not a "berry," but the much-enlarged fleshy torus, or receptacle, to which the numerous very small, rather hard fruits (seeds) are attached. It is botanically a "false fruit," and not a berry at all. The green, ten-parted, star-shaped, leafy structure found attached to the base of the so-called berry is the permanent calyx, which is removed before the fruit is eaten. About six or seven species are natives of the United States, where they grow wild in prairie lands, as well as in the wooded areas. The numerous culture varieties are derived from a comparatively few of the fifteen wild stock species. The desirable qualities are sweetness, delicacy of flavor, good size, small seeds, and pulpiness. 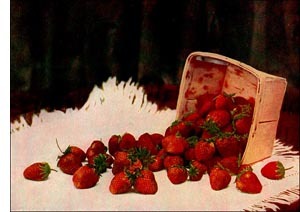 Strawberries, for successful cultivation, require rich soil in a protected place. They do not yield a full crop until the second summer after transplanting. Growers must keep in mind the fact that certain plants produce essentially pistillate flowers and others essentially staminate flowers. Staminate plants are not productive, but are essential in pollination. The yield of berries varies greatly with soil, climate, cultivation, and variety. Under favorable conditions the yield may be over two hundred bushels per acre.